You can download plans for Autumn Leaves here. I've always been afflicted with Canoe Yawl Madness. To me, a "canoe yawl" isn't just a design type; it's a self-contained small boat cruising philosophy. According to this philosophy, skilled boatmen (and women) move their little boats along the coastline in all weather, artfully playing wind and tide to make passages without the stink and clamor of an internal-combustion engine. To watch someone make their anchorage under sail and oar is as lovely and fulfilling as watching Yo-Yo Ma play the cello. 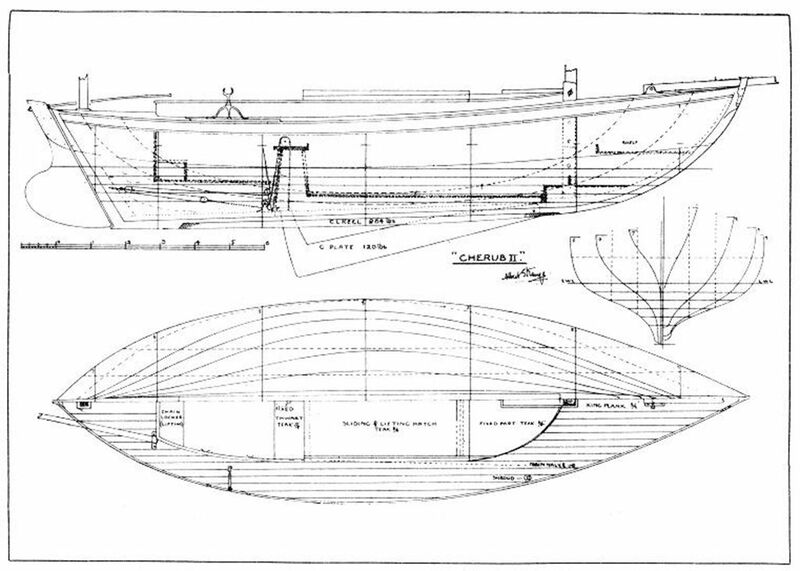 In response, Bolger designed a long series of simpler boats for home-builders intended to be used as the canoe yawls were, and to handle as well. Dovekie, Birdwatcher, and Anhinga are some examples. I owned a Dovekie for awhile and went through a distracting phase of devotion to the Anhinga design, going as far as commissioning an accurate scale model that sits on my desk in front of me. magnificent, and frustrating all at once. 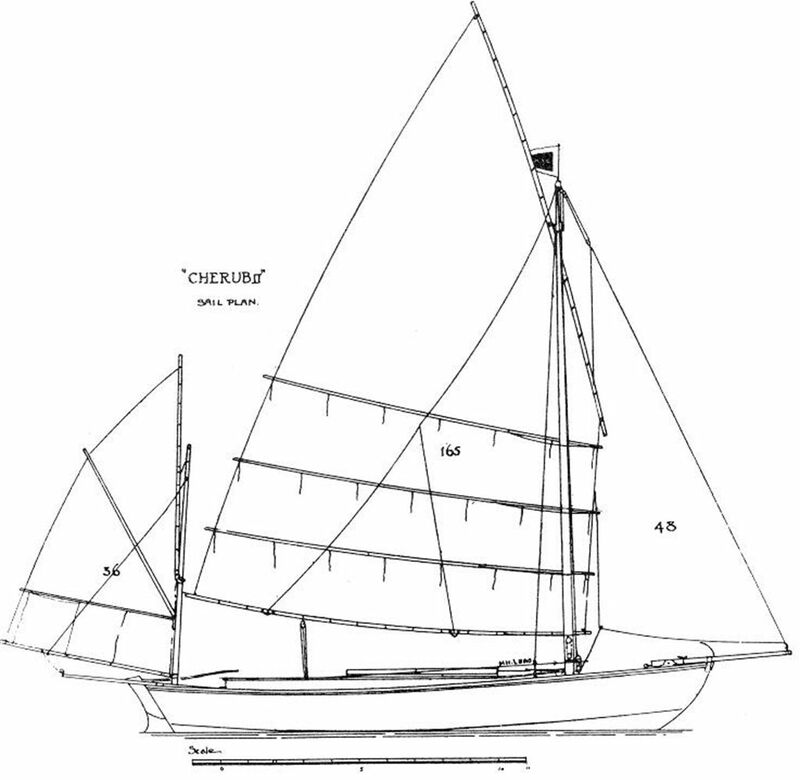 My starting point was Albert Strange's design Cherub II, a heavy, flush-decked centerboarder about 20 feet on deck. I had the idea to reimagine the design in stitch-and-glue plywood, remaining largely faithful to the hull shape, but using CLC's LapStitch™ scheme and water ballast. Even with such advances, I could tell that it was still going to be a life-alteringly big project. Not so much difficult to build, just very time-consuming. 1000+ hands-on hours. If you count drying time the boat would occupy a professional shop for the better part of a year. Such projects have their merits for builder and owner, but not many get built. A beautiful, heavy, complex boat to build. What happened next has been a recurrent theme of my life since childhood. There's a sudden fever-dream of an idea, followed by a burst of energy, while more important tasks (like finishing instruction manuals and answering email) are ignored. "What would happen," I asked no one in particular, "if I could find some happy middle ground between the archly reductionist Anhinga and a so-difficult-to-build-that-you-won't-finish-it-in-this-lifetime boat like Cherub II?" The resulting design, Autumn Leaves, is probably an answer to a question no one is asking except me. And thus the resulting hours spent drawing up Autumn Leaves are billed to personal amusement and recreation. 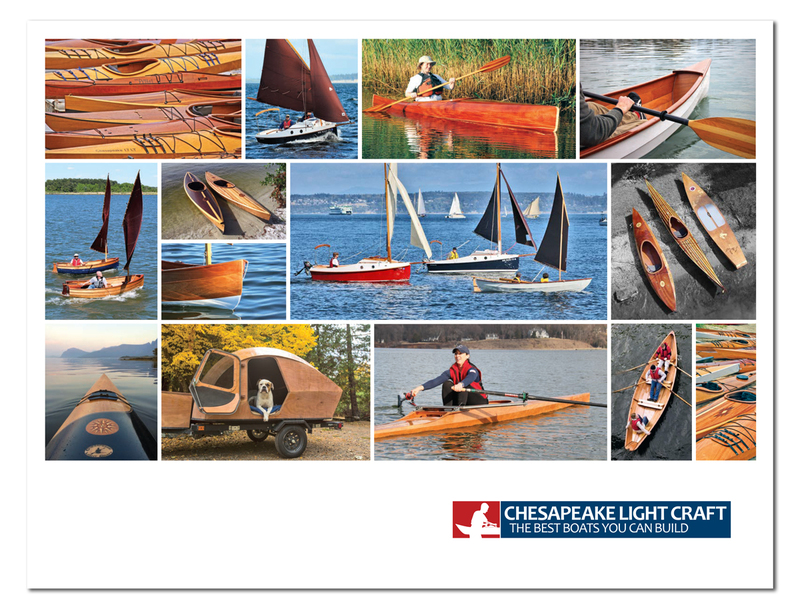 Still, the editors of WoodenBoat Magazine found the design interesting enough to publish in the March/April 2016 issue. You can download plans for Autumn Leaves here. The straight-sided hull eliminates at a stroke innumerable beveled joins; I think the basic hull shell could be built in two weekends. A thousand dollars in epoxy is saved by employing chine logs and sheer clamps, minimizing filleted joinery and structural fiberglass. 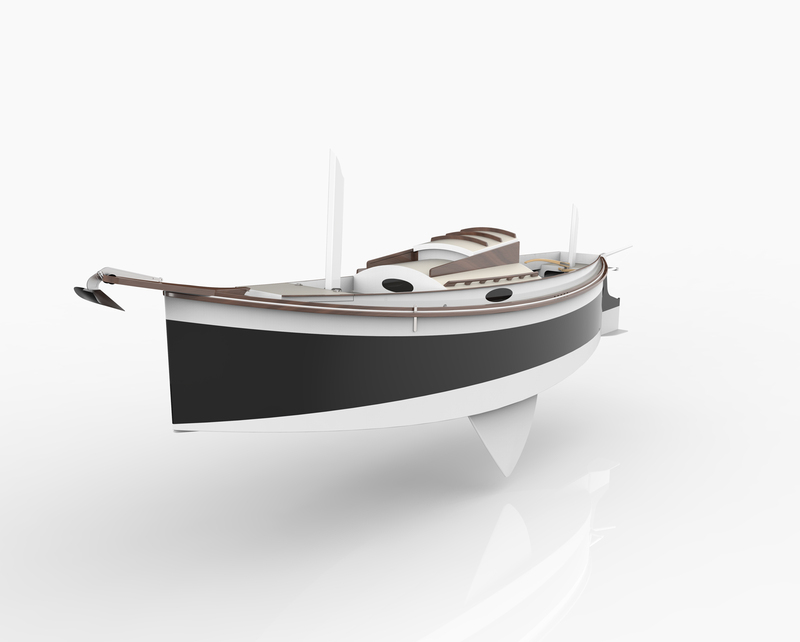 The careful proportions won't entirely disguise the Bolger Box shape, but, if nicely finished, this design wouldn't offend the reactionary yachtsmen sharing the anchorage. And they'd have to appreciate its nimble handling and the skipper's panache in wafting up to the mooring under oar and sail, without a single puff of engine exhaust. 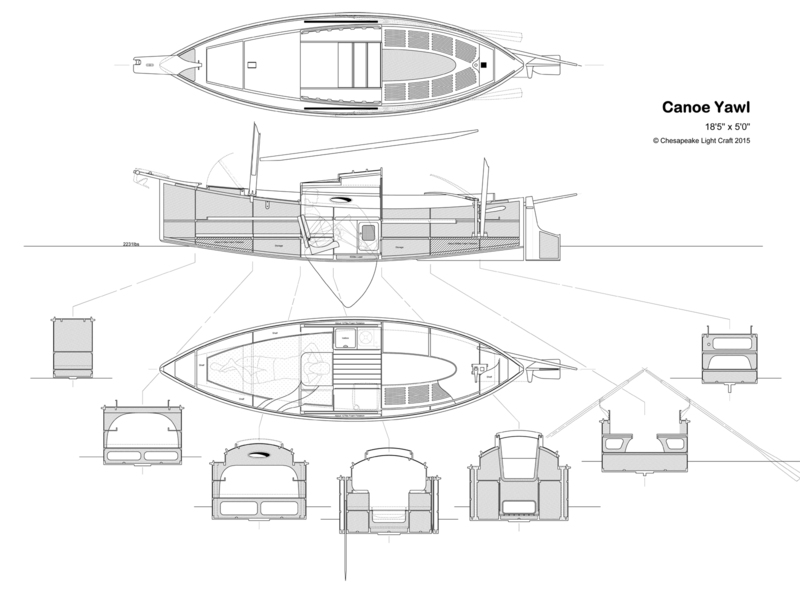 Though delightfully shoal, the boat is not light, and has 600 pounds of lead under the cabin sole. It should be plenty stiff enough for coastwise cruising in the hands of a good boatman. 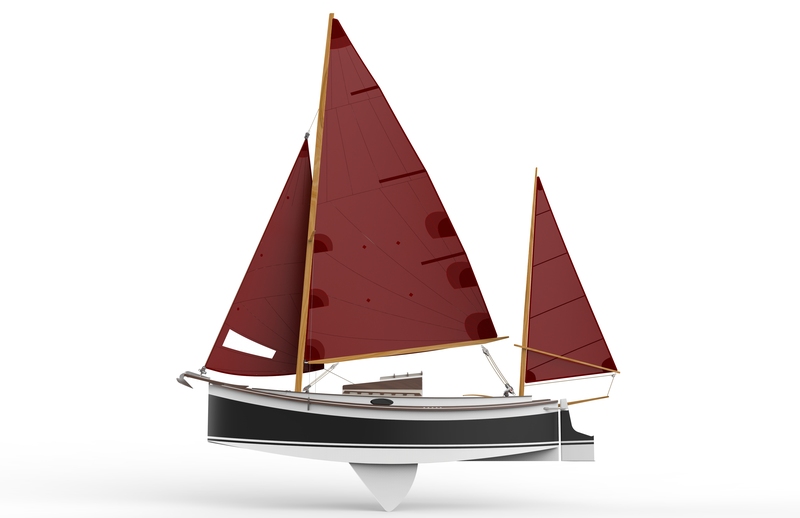 For economy, the rig is supposed to be transplanted from one of the common 16-foot class racing dinghies. A Snipe, Comet, or Windmill would all make suitable donors, while the mizzen could be sewn flat by the builder. 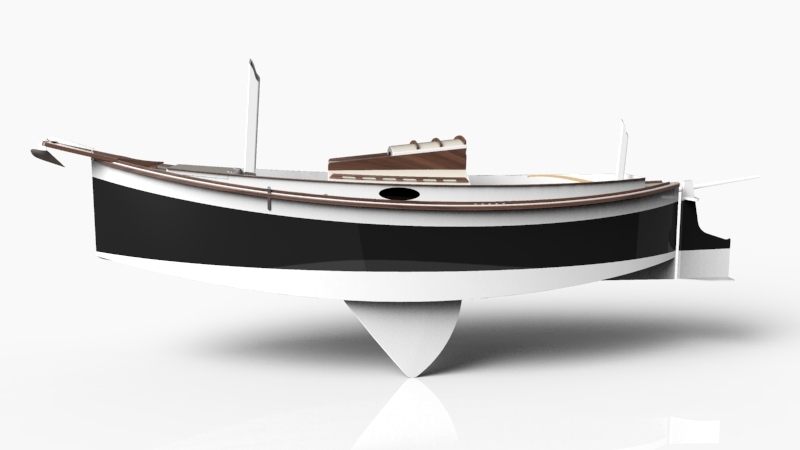 The sailplan is easily handled and of ample size for such an easily-driven hull. To save money, you could recycle the spars and sails from a retired racing dinghy. All of the best-known classical canoe-yawls were very heavy. This made them safer if "caught out," and gives them an assuring solidity underfoot. The weight is a appreciated in a cruising setting. The 600lbs of lead beneath the floorboards of Autumn Leaves will help her carry momentum in tacking. Even in very light air, this easily-driven hull can coast from puff to puff in a way that will help keep the oars stowed. 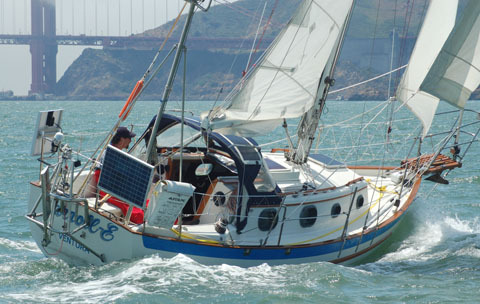 Water ballast is an obvious solution in a trailerable boat. However, building the watertight ballast tanks complicates construction and eats up cabin space. And, as Bolger discovered when the prototype Anhinga was capsized, water ballast is neutral in a swamped boat! Bolger told me that Anhinga resisted efforts to right her following a capsize and swamping. 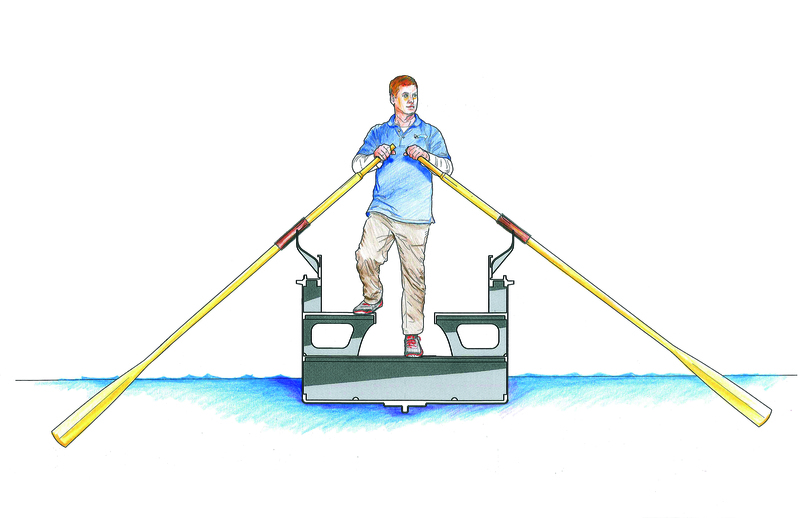 In Autumn Leaves, over a thousand pounds of foam flotation beneath the cockpit, beneath the forward end of the berth, and outboard of the bilge board trunks will work with the lead ballast to help right the boat even when swamped. Twin bilge boards avoid the obstruction in the cabin of a centerboard trunk. I selected bilge boards over leeboards because they'll improve performance under sail, and because they don't require tending when tacking. You can get around the latter with a sturdy cantilevered mount, as on NED (Nesting Expedition Dinghy), or Bolger's Dovekie, but such mounts are more complex to build than a pair of trunks. And she looks more graceful without leeboards slung on the rails. I don't see the skipper working the foredeck much, although there's enough stability to walk around up there. The jib would be on a little roller-furler. All mainsail handling would be done standing in the chest-high safety of the companionway. Even the anchor rode could be led aft, though it's awfully nice to have that draining well in the bow for the muddy rode. The cockpit is self-bailing, definitely an improvement over the original canoe yawls. A compromise to simplify construction is the absence of a conventional watertight footwell in the cockpit. Instead, there's simply decking above the waterline in the rear half of the boat. 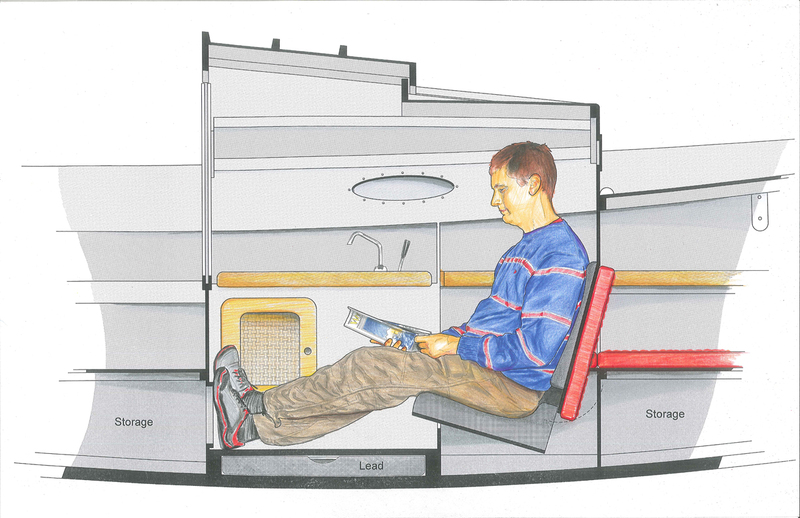 Building a footwell and watertight bench seats would make the boat even more swamp-proof, but will add a lot of time and effort to the project. The upshot is that the cockpit could conceivably hold a ton of water until the drains caught up. On the other hand, I've been cruising coast-wise in boats like this for almost 30 years and never experienced a breaker over the stern that flooded the cockpit. I know from past experience I'll get grumpy emails comparing the boat unfavorably to something like a Dana 24, but such comparisons are unrealistic bordering on ridiculous. This is a big, decked sailing dinghy and should be handled as such. It would take some very bad luck to swamp this boat. Though a little initial tenderness is to be expected in a 5-foot wide sailboat, and you'd be pulling in the first reef when white caps appear, the boat should be safe for coastal cruising as long as the skipper has the sense not to cleat the mainsheet. You won't ship water in the cockpit until knocked down to 74 degrees. Water won't reach the companionway until you're past 100 degrees. It would probably take breaking waves to get her over that far. And if you blunder into breaking waves in a boat like this, shame on you, not on me. Not even the big Rozinante, with her non-self-bailing cockpit, belongs in breaking waves. magnitude simpler than Cherub II. That neatly proportioned coach roof, hatches, and cockpit will require a bit of patient boat carpentry. If you use good marine-grade materials throughout, and I hope you do, the cost savings won't be remarkable compared to buying a beat-up old pocket cruiser on CraigsList. However. It's very hard to find a boat with sailing qualities like this at any price. And don't discount the psychological value of such rapid hull assembly. While the glued-lapstrake builders are still setting up their molds and lining off the planks, Autumn Leaves builders are already fitting the cockpit and interior. I would use the time-savings of the simplified construction to focus on the outfitting. Those details - things like working out an ergonomic system for storing gear below, the leads of sail control lines, designing a simple trailering scheme, and so on - are what add up to relaxed and pleasurable cruising. Having that extra hundred hours or so for your fit-out means Autumn Leaves will arrive at the launch ramp a much more refined cruising machine. and a tiny carbon footprint than a boat like this. This is unapologetically a single-hander, at least when it comes to sleeping aboard, which will make it a hard sell. I've participated in many pocket cruiser retreats, and find that the boats are nearly always single-handed, the family having chosen to stay home rather than rough it on a small boat. However, the boats were SOLD to the family on the basis of being able to daysail and sleep everybody. Thus this one appeals only to a determined singlehander. The cabin is small, as with all of the famous canoe yawls. It's unusually ergonomic, however, and a vast improvement over Cherub II and its ilk. There's a palatial single berth. 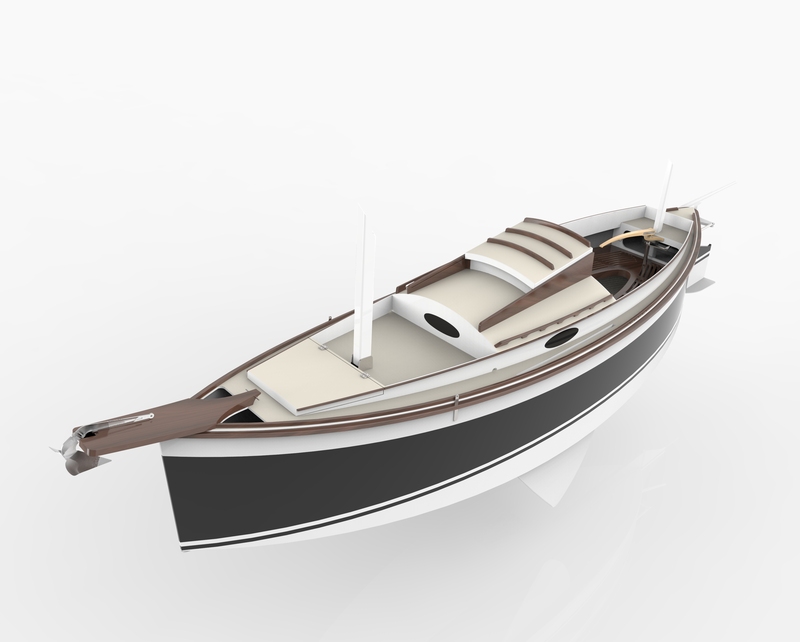 The aft end of the berth flips up to create a luxurious "throne" for the singlehander. All cooking, eating, and contemplation may be done from this plush chair. Someone used to traveling light could make themselves at home for weeks at a time. The self-bailing cockpit is large, allowing the skipper to row the boat standing up and facing forward. Unfortunately, two overweight adults sitting there would probably upset the boat's trim. Perhaps I'll draw a bigger sister, with an identical layout, but with accommodations congenial for two extra-large adults. Builders undertaking Autumn Leaves should be comfortable reading traditional boat plans, and have at their disposal stationary tools such as a tablesaw and a bandsaw. The neatly proportioned coach roof, hatches, and cockpit will require a bit of patient boat carpentry. Construction of a scale model would be a great way to get acquainted with the design. Plans consist of 17 detailed pages. Once downloaded, they may be printed on 11" x 17" (280 x 432mm) paper. 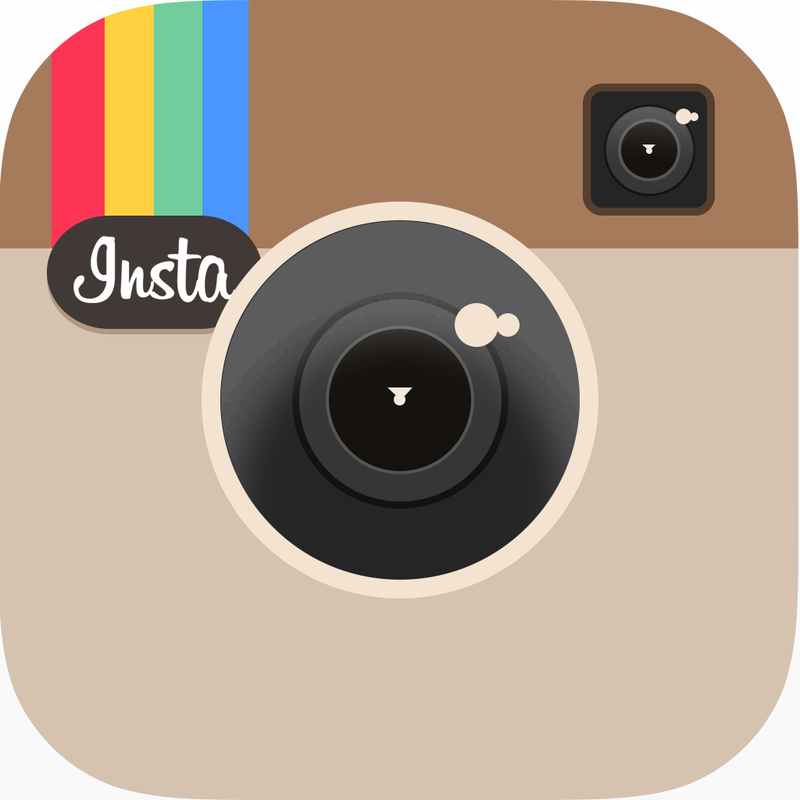 All dimensions are in both standard and metric units. This is a speculative design. A prototype has yet to be launched. We could CNC-cut a kit comprising all of the plywood parts; study PocketShip for a rough idea of what a kit would cost.